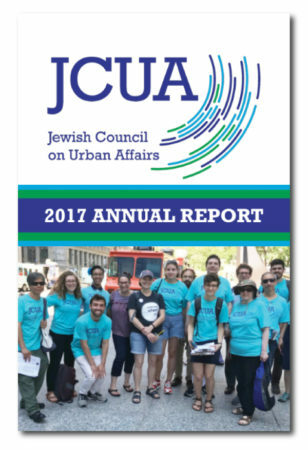 Over the past fifty years, JCUA has flourished as the Jewish voice for social justice in Chicago. Our longstanding mission, to combat poverty, racism and antiSemitism in partnership with diverse communities, has been a consistent unifying message and guiding light for our work. Today, JCUA and its members are powerful allies and advocates for positive social change in Chicago. We work in partnership with coalitions and directly impacted communities to address the root causes of disparity in our city. We do this through issue-based campaigns, community investment and bridge-building with communities facing discrimination. No other Jewish organization in Chicago is using a community organizing model to advance systemic change on domestic issues with a local focus. JCUA members pray with their feet. Our brand of social justice reinterprets traditional notions of “tzedakah” and social action, and calls on Jews across Chicago to do more; to make a connection between our history of oppression as a “people” and the importance of standing with those who face oppression today. Remembering that “we were slaves in Egypt”, means safeguarding the dignity, economic security, and inclusion of structurally vulnerable people on the margins of our society and economy. Read more about JCUA’s Jewish Values. We are building relationships within the Jewish community to urge people to action: advocacy and organizing combined with an ongoing commitment to partnering with people who are marginalized by policies and systemic discrimination. JCUA members know that the needs of all Chicagoans can be addressed if there is sufficient public will to act together to elevate our shared humanity. Want to live your Jewish values AND have an impact on social justice in Chicago? Join Us.